Zombie Curse: Your inventory will be constantly flooded with poisionous potatoes. Slime Curse: You will be slowed down, and your jump height will be increased. Spider Curse: Your character will constantly be bumped around the screen. 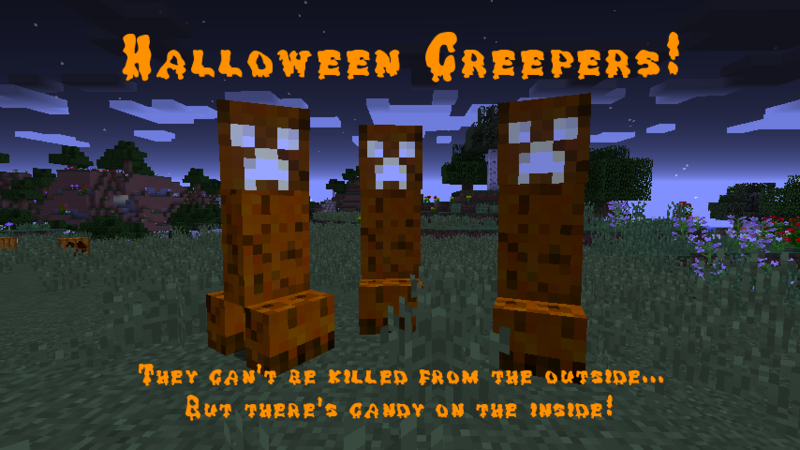 Creeper Curse: If you swing your weapon too often, the creepers circling around your head will explode. 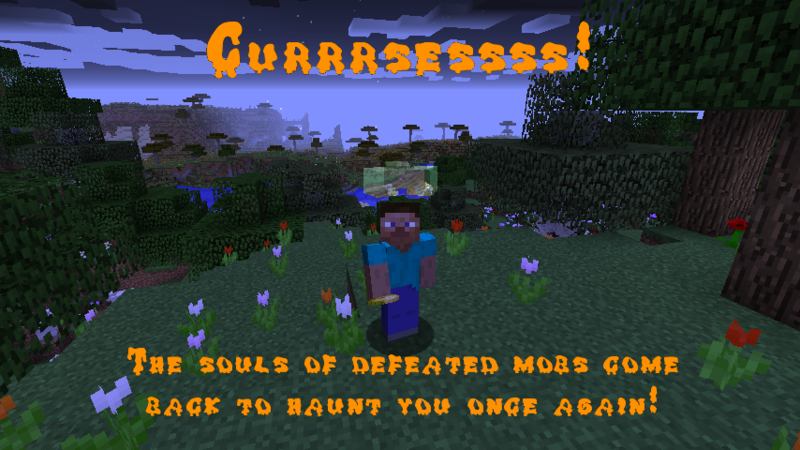 Ghast Curse: Monsters within 50 blocks of you will gradually walk towards your position. Skeleton Curse: Your health will be in a constant state of flux, it's like health roulette. Trick-or-treaters have one thing in mind: candy. In fact, they want it just as much as you probably do. 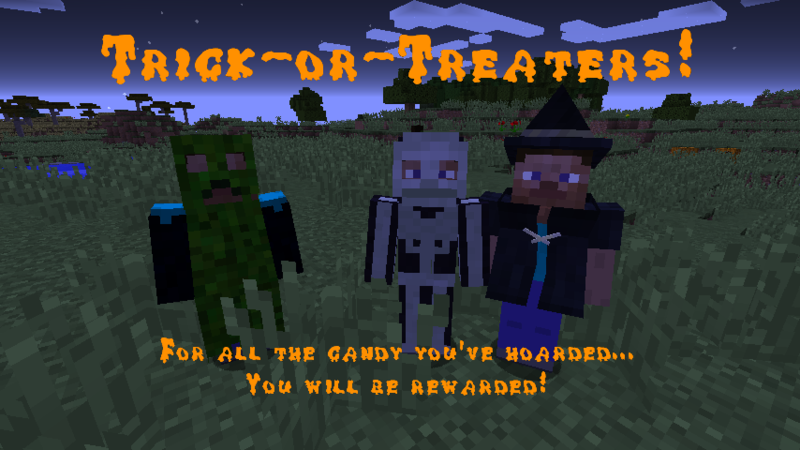 If you find yourself getting a surplus of sugary goodness, give a few out to the trick-or-treaters and you might be rewarded for your efforts. For every kind of candy, there's a type of trick-or-treater who likes it the most. However, they all enjoy mega candy, so you can't go wrong with giving those out. Just be careful: if you (for some sick reason) decide to kill a trick-or-treater, an angry monster will show up to get revenge. And with that... Have a very ghostly Halloween Night! And try not to get too,/i> scared out there... There's always a chance you might survive! 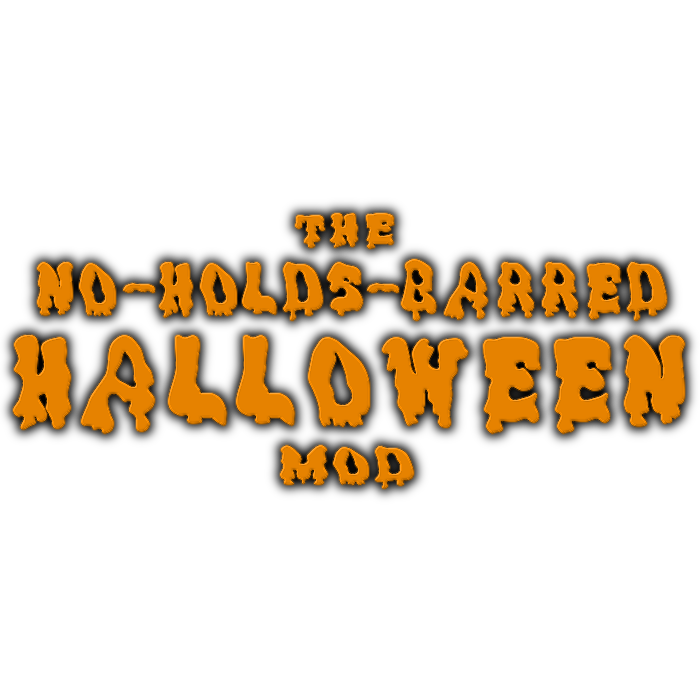 This is a remake of the No-Holds-Barred Halloween Mod, originally created by KodaichiZero for Minecraft Beta 1.8.1 and revived with his permission. Thanks go to Kodaichi for creating the original mod and for allowing me to resurrect it. Thanks also go to ivuul and Shamos2000 for their assistance testing my version. 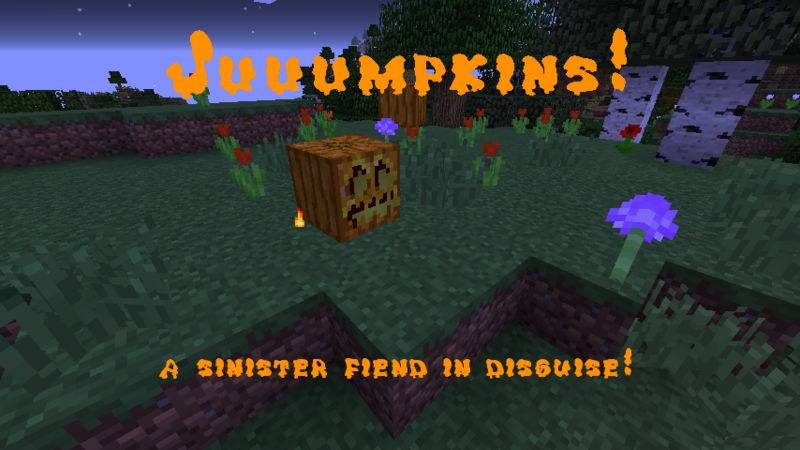 For more information, please visit the Minecraft Forum thread. Is there anyway to configure the mod so I can have mobs spawn at anytime of the year? I'm using twitch. I checked the mod box but the config button wasn't press able. Help? Sorry but no, I'm not going to backport any lower than 1.10.2. Will you be adding more content over time or keeping it as it is? I don't have much in the way of plans for additional content at the moment. I'm open to ideas though, and if anybody has a suggestion which I think would fit well then I might add it. I loved this mod, if there isn't configs to enable and disable each feature there should be because this could be used in alot of ways. <3 Thank you! Yeah I'm beginning to realise - people want more config.. OK, I'll make it happen! Thank you! I loved this mod. I have one question tho, in the config there is an option for legacy vs. new version. What are the differences this affects? The differences are in the curses. 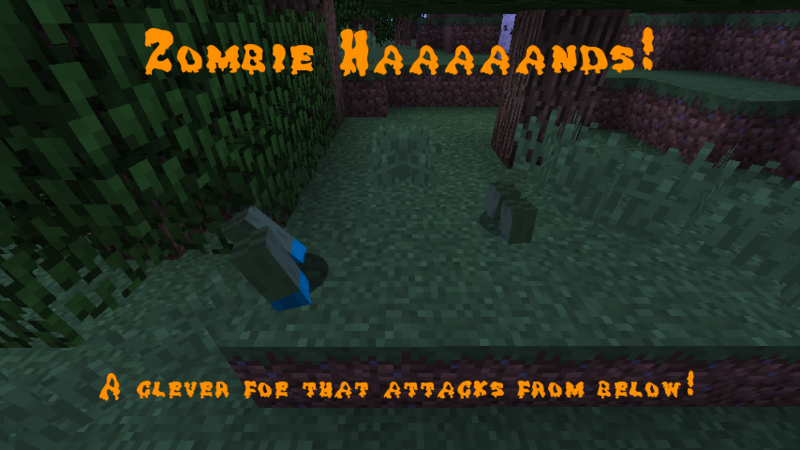 Zombie Curse: You will be slowed down, and your jump height will be decreased. Slime Curse: Your inventory will be constantly flooded with slime balls. This sounds like something fun to put on my server! 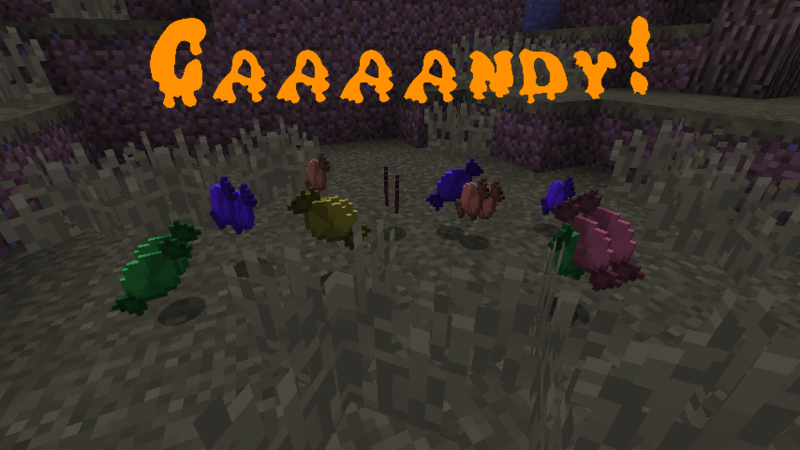 I have to ask though, is there a safe way to uninstall or disable the mobs spawning once Halloween time is over? Also, is there a way to disable the Witch? 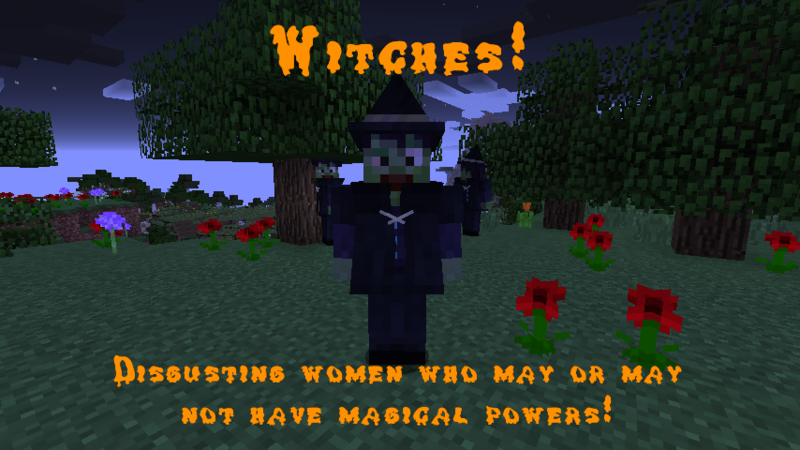 Not currently, but I can certainly add that so that the mobs stop spawning after Halloween. Why would you want to disable the witch?